Please pay attention: although the 2016 MDX is the same generation as the 2014/2015 model year, their SH-AWD system are dramatically different from each other. In short: the latest SH-AWD on the TLX and MDX is NOT the same SH-AWD you might be thinking of – in fact you can consider it to be a VTM-4 PLUS version (I will explain why in the later sections). 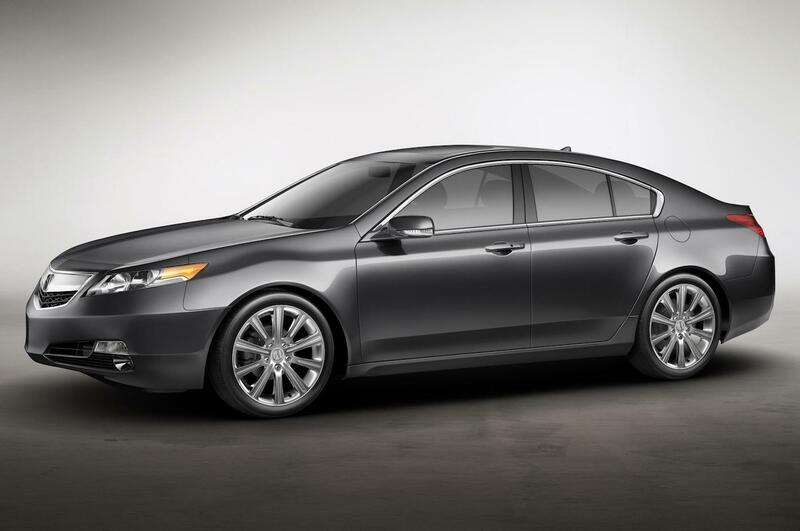 The type 4 (2014 Acura RLX Sport Hybrid SH-AWD) is totally different than the rest types: its front wheels are driven by the gas engine, and the rear wheels are driven by an electric motor. This SH-AWD is not within this article’s scope of discussion. Below image is the SH-AWD system used on the Acura RL. Acura SH-AWD all-wheel-drive system rear differential. Firstly, let’s focus on the SH-AWD type #2 mentioned above. 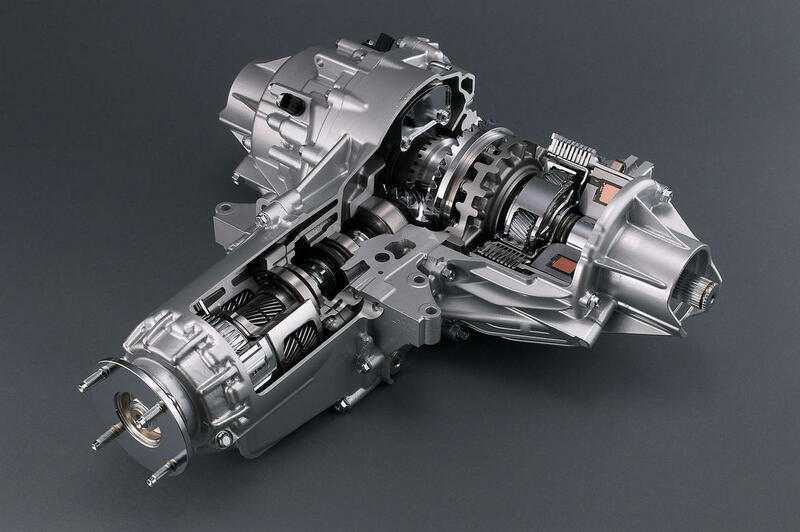 You may already know that the SH-AWD system is using a center drive shaft with one end connected to the front transaxle, and the other end attached to the rear drive unit. 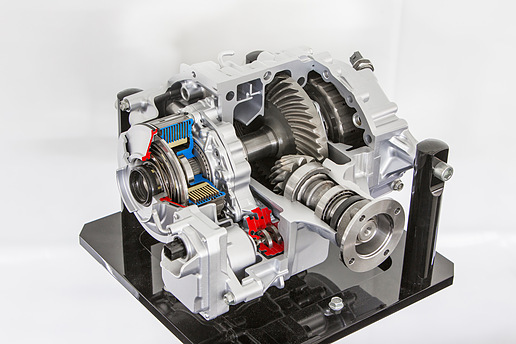 Within the rear drive unit, there is a hypoid gear that diverts the power to each rear axle. At this moment, the SH-AWD is still the same as the VTM-4 system. However, things become more interesting after this step. For SH-AWD, each of its rear wheel is connected to a planetary gear set and an electromagnetic multi-plate clutch pack, which receives power from the above mentioned hypoid gear. One common misconception is: the electromagnetic multi-plate clutch pack is acting as a power coupling, and it is in charge of delivering power from the engine to the rear wheel. This conception is wrong. In fact, the SH-AWD is similar to an AWD system which uses a planetary gear central differential with multi-plate clutch acting as limited slip feature; the difference is, SH-AWD uses two of such differentials, one for each wheel. Please see the diagram below, showing the power flow for each rear wheel. For a brief introduction of what is a planetary gear set, please refer to the Appendix 1 at the end of this article. For SH-AWD, there is a planetary gear set for each rear wheel. 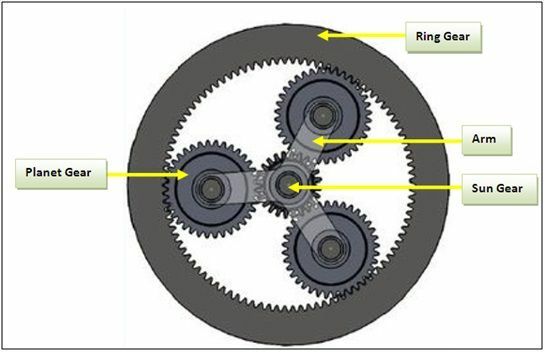 The Ring Gear is connected to the center drive shaft (via the hypoid gear); the Planet Gear Carrier is connected to the half rear axle (which drives the rear wheel); One group of the clutch plate is connected to the Sun Gear, and the other group of the clutch plates is fixed to the rear power unit casing and is completely stationary. The below image clearly shows how the clutch pack is constructed in the rear drive unit. If the clutch pack is fully locked up (which means the Sun Gear is stationary), the different gear numbers between the Ring Gear and the Planet Gear will cause the Ring Gear (connected to the front wheel ultimately) and the Planet Gear Carrier (connected to the rear wheel) to spin at different speeds, thus the rear wheel will spin 1.7% faster (overdriven) than the front wheel. However, if the car is running on a straight line and the road surface has excellent traction (for example, driving on a straight interstate highway), it is impossible that the rear wheels are spinning 1.7% faster than the front wheels. This is because: if that could happen, the front wheels are effectively braking the car, which does not make sense at all. Therefore under that situation, both the front and rear wheels have to spin at a similar speed, the clutch pack also does not lock up, therefore the Sun Gear will rotate slowly, and sliding friction exists within the clutch plates. The SH-AWD control unit adjusts the pressure applied on the friction plates. The torque generated from the friction force will leverage through, and magnified by the Sun Gear and the Ring Gear, then supply to the Planet Gear Carrier, and finally reach the rear wheel. 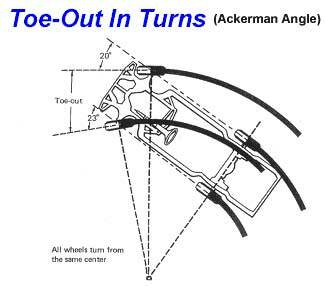 This is the process of how the rear wheel obtains torque from the engine. When the clutch pack is fully disengaged, there will be no torque transferred to the rear wheel at all. 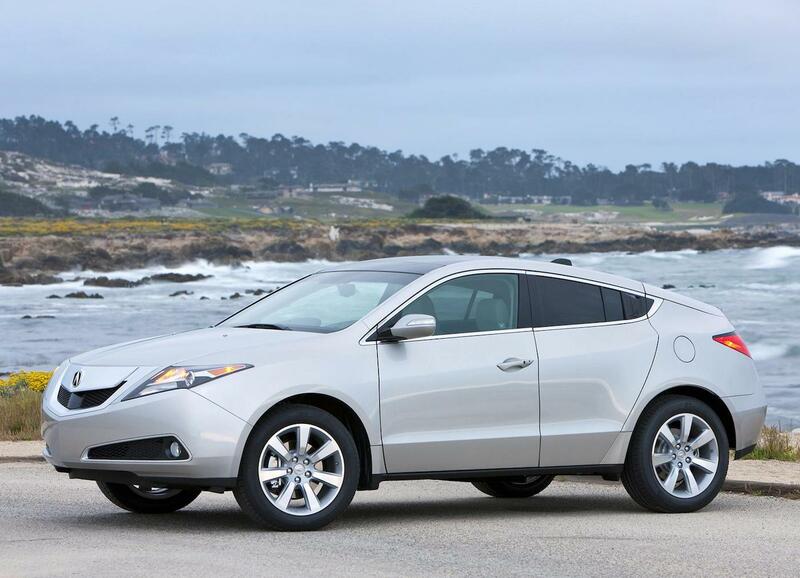 Take MDX for example, the SH-AWD can transfer up to 70% of the total torque to the rear wheels. This torque split ratio can only be achieved when the clutch pack is fully locked up, which equivalents to the case that rear wheels are spinning 1.7% faster than the front wheels. From the above discussion we know this can only happen during hard cornering, so this is also the reason why in the official product description, Acura says “On a curve under hard acceleration, 70% of effective torque can be directed to the rear” – pay attention to the wording, Acura mentioned “curve” for reasons. From the below image you can see the solenoid force generated from the armature air gap is passed on to the piston, which will compress the clutch plates that are fixed to the casing. Here is a question that can test your understanding of the SH-AWD system. Question: What is the difference between SH-AWD, and AWD system using a planetary gear set center differential + multi-plate clutch as limited-slip? Answer: for AWD system using a planetary gear set center differential + multi-plate clutch as limited-slip, there is one input: engine power; two outputs: one to the front wheels and the other to the rear wheels. Clutch pack is used to vary the torque split percentage based on the default ratio. For more in-depth analysis of the planetary gear center differential, please see Appendix 2 at the end of this article. 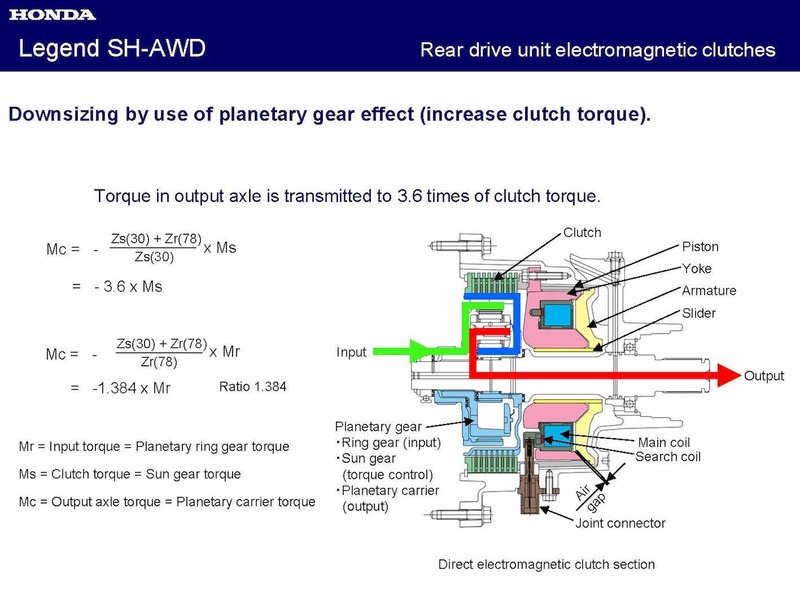 For SH-AWD, each of the planetary gear set + clutch pack: input is the engine power, output: one to the rear wheel (Planet Gear Carrier), and the other one is to the clutch (Sun Gear) – which “simulates” a virtual wheel. If one “wheel” (simulated by the clutch) gets traction (implemented by engaging the clutch), another wheel (the rear wheel) will get power too. The clutch is used to determine how many torque will be delivered. Because each rear wheel has its dedicated planetary gear set and clutch, the torque applied on each of them can be adjusted separately, which achieves the torque vectoring goal. 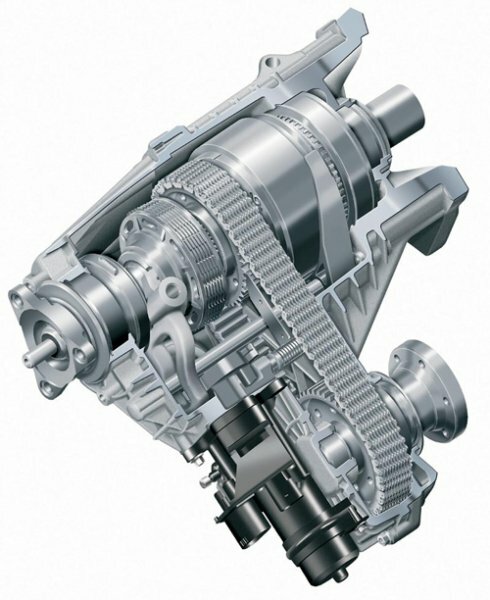 Below is an illustration of the planetary gear center differential, with multi-plate clutch acting as limited-slip feature, on the Volkswagen Touareg. It shows the similarity/difference between the SH-AWD and a planetary gear center differential. You can see clutch pack, which modulates the torque distribution between the front/rear wheels. Why SH-AWD Can Constantly Handle Large Torque? From our previous article describing how the Twinster AWD system work in the Focus RS, we know the GKN Twinster clutch pack is fully responsible to transfer power to the rear wheels. This means in the Focus RS, if each rear wheel gets 50hp, then this 50hp is transmitted wholly through sliding friction within the clutch. Hence, there will be serious wear and overheating issue if the clutch is engaged for a long time. On the other hand, if you have driven the Acura TL/MDX, you will see the rear wheels frequently get lots of power; in constant speed cruising, the rear wheels still get at least 10% of torque split. 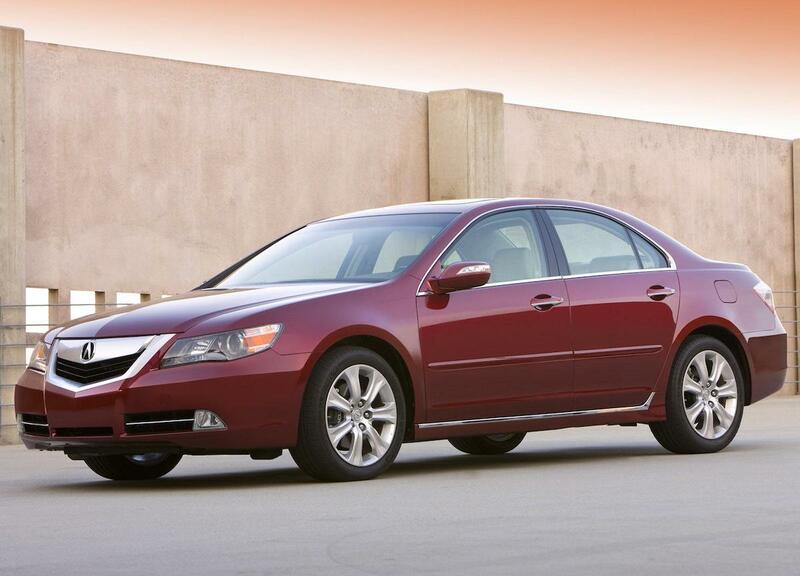 For the Acura RL, the rear wheels can even get 30% of the engine output constantly. Why the SH-AWD does not need to worry about the wear and overheating? 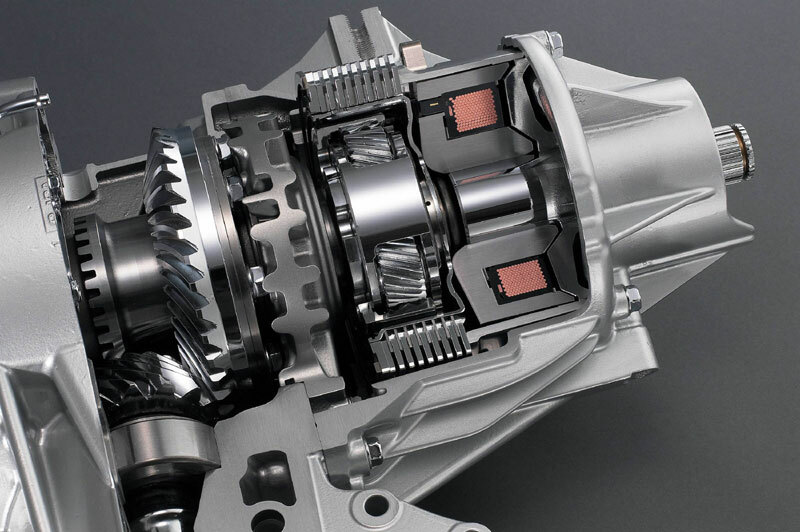 To answer this question, we need to remember: the clutch pack in the SH-AWD is NOT mainly responsible for transmitting power, instead it is used to “modulate” the torque transfer relationship between the Ring Gear (input) and Planet Gear Carrier (output), there is much less stress applied on the clutch plates. Inside SH-AWD’s each planetary gear set, the Ring Gear has 78 teeth, the Sun Gear has 30 and each Planet Gear has 24 teeth. Simple algebraic computation tells us: the torque on the Ring Gear is 2.6 times of the Sun Gear (78/30 = 2.6). Therefore, the total torque the Planet Gear Carrier receives is 3.6 times (2.6 + 1 = 3.6) of the torque applied on the clutch pack (which is connected to the Sun Gear directly). In other words, to transmit 1hp, the load on the clutch plates is only 0.278hp; Other mechanical gear components is responsible for transmitting the rest of 0.722hp. From another aspect, the clutch pack can also be viewed as an energy absorber, which takes care of the excessive energy generated by the 1.7% front/rear wheel speed difference. Therefore, the wear and heat generated by the sliding friction is much less in the SH-AWD. Compared to other AWD systems such as the GKN Twinster and the Haldex, the clutch pack in SH-AWD only need to handle 27.8% (1/3.6) of the workload that the Twinster/Haldex systems need to handle under the same output condition. This is the reason why higher load can be applied on the rear wheels more frequently in the SH-AWD system, without the wear and overheating concern. When SH-AWD Will NOT Work? Why does Acura build a 1.7% overdrive ratio between the front and rear wheels, in MDX/ZDX/RDX/TL? 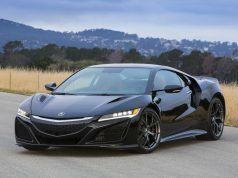 What if Acura did NOT build in the front/rear rotation speed difference? If that was the case, when you are making a right turn, your left rear wheel will spin much faster than the front wheels. Whenever the clutch is engaged, the planetary gear set will fall into the case that the input is trying to drive something (the output) which is spinning faster. This means the engine is providing a braking effect to the rear wheel, which will cause loss of control and is not what we want. So if there is no build-in rotation difference, the rear wheel is unable to get any power during cornering, not to mention the torque vectoring. Is there any chance that the rear wheel spins more than 1.7% faster than the front wheel? The answer is yes. Suppose you are making a turn and the turning diameter is large enough to assume both the front/rear wheels are turning with this same diameter. Take the MDX as an example, its rear track width is 1.684 meters, therefore if the turning radius is 49.5m, the outer rear wheel will spin (1.684/2)/49.5 = 1.7% faster than the front wheels. Therefore, if your turning radius is less than 49.5 meters (162.4 ft), theoretically speaking the MDX’s rear wheel will be spinning faster, and using up all of the 1.7% rotation speed difference allowance. When that happens, the output clutch plates (connected to the Sun Gear) will start to spin in the opposite direction, and the clutch has to be completely disengaged to avoid the previously mentioned “braking effect”; and of course, the rear wheel does not get any power during that time period. Many people have driven the MDX/ZDX/TL under various conditions, why no one has ever noticed the above issue? First, the above is just a theoretical computation, there are two factors that help to alleviate the above issue. when the turning radius becomes small enough, the fact that the front wheels have larger turning radius than the rear wheels will start to take effect, this is another type of “cushion” that can be consumed before the 1.7% overdrive allowance is touched. Therefore, the cornering radius that makes SH-AWD ineffective may not be 49.5 meters (162.4 ft) as calculated above, but it will exist in a range between 0 and 49.5m. Below illustration shows us, during a tight turn the car’s front wheels will have a relatively larger turning radius than the rear wheels. The major difference between the SH-AWD on the RL and MDX/ZDX/TL is, it installed an Acceleration Device in front of the rear drive unit. That “Acceleration Device” is in fact a 2-speed transmission: one gear provides the 1.7% front/rear wheel overdrive ratio; the other gear provides a higher 5.7% ratio. Below illustration shows the Acceleration Device installed in front of the rear drive unit. The reason why it needs the 5.7% ratio is to address the above mentioned issue: small turning radius will make the SH-AWD ineffective. By providing a higher overdrive ratio, it is less possible that the rear wheel will use up the allowance provided by the overdrive ratio. 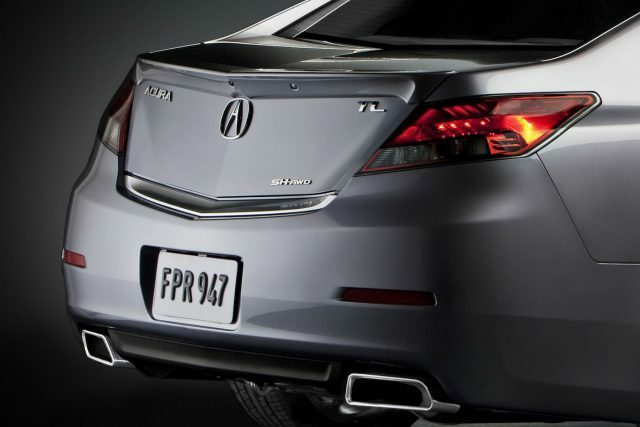 This means, the SH-AWD on the Acura RL can cover a broader turning radius range than the SH-AWD on other Acura models. However, although not taking the full workload, the rear wheel clutch still need to take care of a portion of the energy. Therefore a larger overdrive ratio means higher wear and heat in the clutch pack. So under normal driving conditions, the Acceleration Device will shift to another gear that uses a lower overdrive ratio to decrease the wear and heat. The only disadvantage of this design is: there is a time lag for the Acceleration Device to shift between the two gears, so it may not work as fast as you wish under some special driving situations. 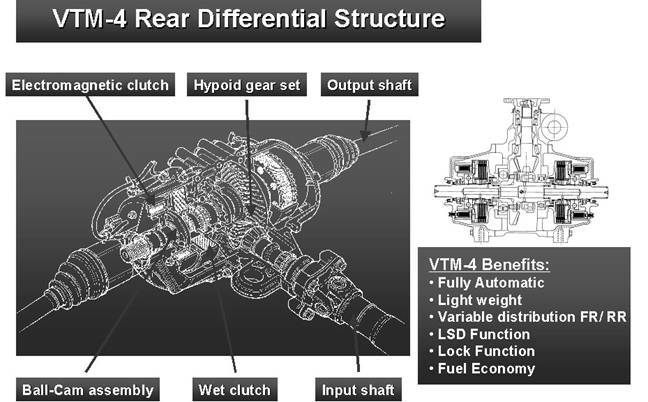 In the SH-AWD system, for each rear wheel if you replace the planetary gear set plus the clutch with a single wet-type clutch pack, you will get the VTM-4 system (of course some components and also the ECU are different, however the mechanical schema will be like this). See the below illustration. This changes the way how the rear wheel drive unit work fundamentally. Now the clutch pack is 100% responsible for transmitting power to the rear wheel. It works in the same way as the GKN Twinster. Wear and heat generated from friction become a big concern, therefore the VTM-4 system cannot deliver power to rear wheels for a long period. In fact, after the vehicle reaches the speed of 18mph and in constant-speed status, the clutches in the VTM-4 will completely disengaged, which means the vehicle is effectively in pure FWD mode under this condition (during acceleration, the VTM-4 can still kick in and provide temporary torque to the rear wheels). Please note: the description here only applies to 2015 and earlier model years Pilot. On the latest TLX and MDX, Acura “secretly” changed the SH-AWD system design. 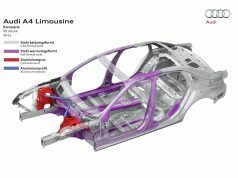 Below is a cut-away image showing its mechanical structure, you can see it can be considered to be a variant of the Honda VTM-4. 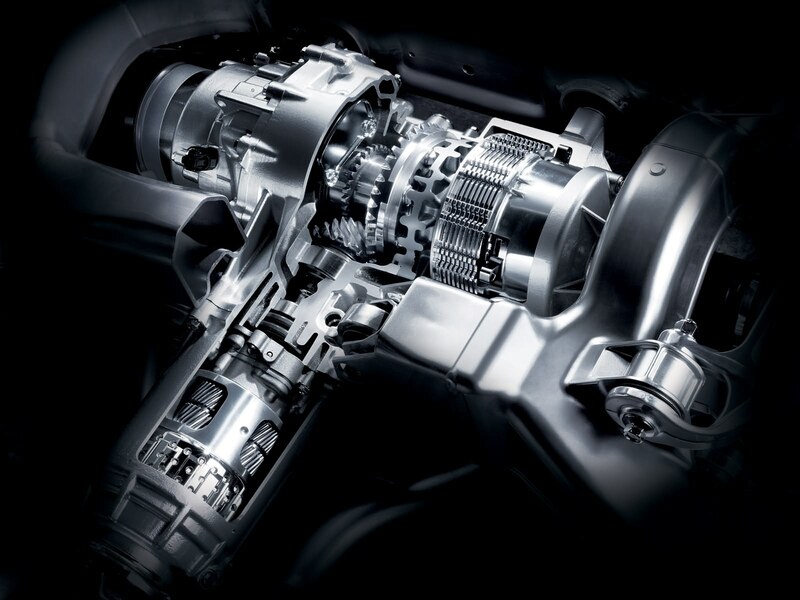 Simply speaking, clutch packs in the new SH-AWD system are responsible for 100% of the workload, with the increased 2.7% overdrive ratio, the wear and overheating issue should be more serious than before. The reason why Acura can still let such system pass at least 10% of the torque during cruising in a straight line is: progress in the material technology make it possible to manufacture clutch plates with excellent anti-wear properties, so although there are lots of friction wear and heating under normal operating conditions, the new SH-AWD component can still maintain good reliability. For the 2016 and up Honda Pilot, although Honda is marketing its AWD system as “i-VTM4”, it is in fact identical to the latest SH-AWD. 1. The “old” SH-AWD can be thought as working with a similar principle as other AWD vehicles who are using planetary gear center differential + multi-plate clutch as limited slip; their difference is just the layout and also the limited-slip ratio settings. 2. The new SH-AWD and the GKN Twinster (used on the 2016 Ford Focus RS) are intrinsically the same. As shown in the above image, a planetary gear set is composed of THREE major components: a Ring Gear, a Planet Gear Set (including 3 planet gears, and one planet gear carrier – the “Arm” in the above image) and a Sun Gear. For such 3 components, it can be configured as 2 for input + 1 for output, or 1 for input + 2 for output. Or by controlling the load on one of the component, the input/output relationship in the rest 2 components is fixed. If you have read our previous articles related to AWD systems (for example the Audi Quattro/VW 4Motion), you may know some of the AWD systems are using a planetary gear set central differential with multi-plate clutch acting as the limited-slip functionality. This is exactly how such central differential can vary torque delivery percentages between the front and rear axles: it use the clutch set to control the load on components of the planetary gear set (by varying the pressure applied to the friction plates), then the power delivery ratio can be determined for the two output components (one connected to the front and another one connected to the rear). When the clutch is completely opened (released), the torque split ratio is the default ratio. 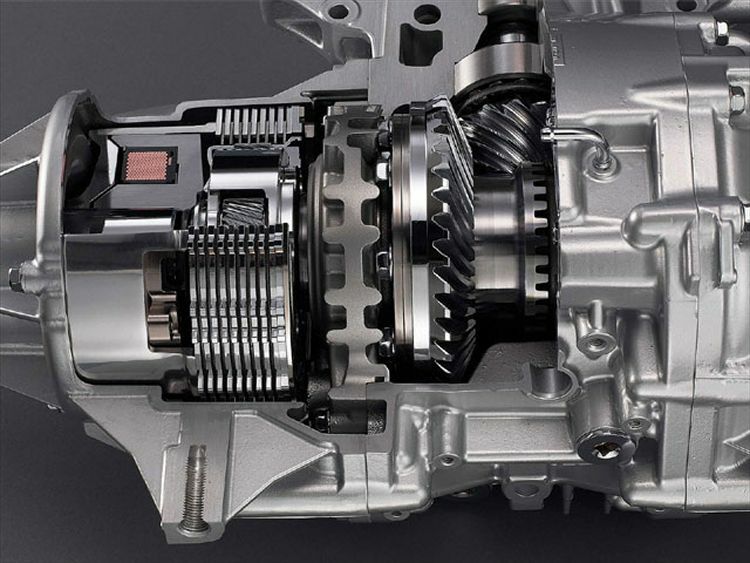 For example, the Porsche Cayenne’s default front/rear power ratio of 38:62 means, when the limited-slip clutch plates are completely released, the other two components in the planetary gear set central differential receive 38% and 62% of the total input power respectively. Awesome article. Great read. Very nicely put. I have a 2008 RDX with the SH/AWD. I remember driving in a snow storm over a mt. at 80 mph and hittin an ice patch. The car verved to the side for a fraction of a second and then recovered. This was about 10pm at night in the middle of nowhere. I believe the car about 1/4 mile behind me driving the same speed went off the road. In other words I swear by this drive system. My question is; with the newer RDX not offering the SH/AWD package will I be taking a step backward in handling and power distribution? The 2019 RDX will have SH/AWD again. Can you make this a living article and update it with new info on the 2019 SHAWD ?